Gaining a few kilograms during the year may not seem like a big deal. But when these KGs add up over time and make you overweight, then that become a problem. As you have probably heard, more people are overweight today than ever before. Experts are calling this an “obesity epidemic.” This health problem affects young people as well as adults – one third of all kids between the ages of 2 and 19 are overweight or obese. In such a circumstance, people get so worried that they think of going for surgeries or taking diet pills or even starve and skip meals. But do you really think that these procedures are safe? Well I do not think so. Probably the best way to maintain your body weight is to do regular exercise and have a balanced and weight loss friendly diet. And there is nothing better than honey to lose weight. 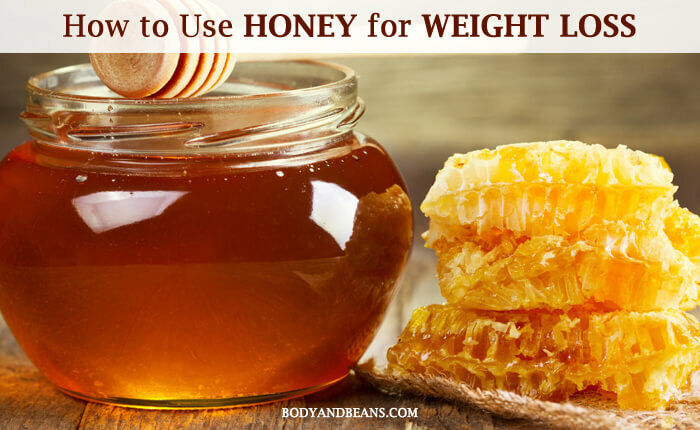 Today in this post, we are discussing about how to use honey for weight loss. I am also sharing the list of 19 tips that you can use to lose weight with honey. In our looks-obsessed society, many think that being overweight is an appearance issue. However, being overweight is actually a medical concern because it can seriously affect a person’s health and wellbeing. When people eat more calories than they burn off, their bodies store the extra calories as fat. A couple of pounds of extra body fat is not a health risk for most of us. But when people keep up a pattern of eating more calories than they burn, more and more fat builds up in their bodies. Eventually, the body gets to a point where the amount of body fat can have a negative effect on a person’s health. Nowadays, younger people are developing health problems that used to affect only adults and extra body weight can be blamed for this. The health problems that stem from being overweight go way beyond the ones we usually hear about, like diabetes, high cholesterol, high blood pressure and heart disease. Being overweight can also affect a person’s joints, breathing, sleep, mood, and energy levels. Just a few kilograms of extra body weight can seriously affect a person’s quality of life. Thankfully, losing extra body weight is not that difficult, especially when you are determined to put off the extra body weight. Regular exercise, rightly balanced weight loss friendly diet, yoga and other remedies can help you to lose weight. Honey is one such magical ingredient that may help you to lose weight and stay fit and healthy. Honey is actually beneficial for our health and it can be used as a substitute for artificial sugar. But before we learn about how to use honey for weight loss, let’s understand the chemical composition of honey and how it helps in losing weight. For example, Dobrudzha’s sunflower honey may differ in composition from the same kind of honey produced in the region of Yambol. In such a circumstance, summing up the composition of honey by using comparative tables is a complicated and strenuous process both because of the possible fluctuations in the components of the same varieties of honey and the great variety of honey types. The benefits of honey mostly apply to weight loss programs. 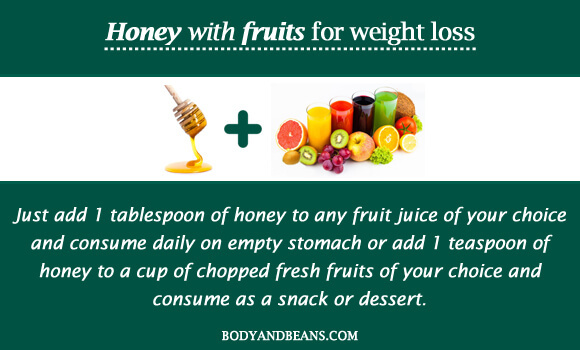 If you are trying to lose weight, honey can be very helpful. Many people have the quarry that – isn’t honey a type of sugar? Does it contribute to weight gain? Well honey does contain sugar but with a difference. Refined table sugar, which people often use to sweeten their food, is considered a source of “empty calories”, which means that there is no ulterior benefit to eating them. On the other hand, unlike refined sugar, honey contains beneficial vitamins and minerals as well. Therefore, for people who are overweight or obese, honey not only reduces the risk of cardiovascular disorders, it also does not increase the body weight. Findings of research study suggests that consumption of honey may help in reducing cholesterol as compared to sugar. It also leads to the lower increase in plasma glucose levels. Fat remains as an unused resource in the body adding bulk and weight. But it is believed that honey has the ability to mobilize this stored fat. When this fat is burnt to provide energy for your daily activities, you will see a gradual decrease in weight and a relief from the problems of obesity. So, without waiting any further, let us discuss the ways honey can be used to reduce weight. 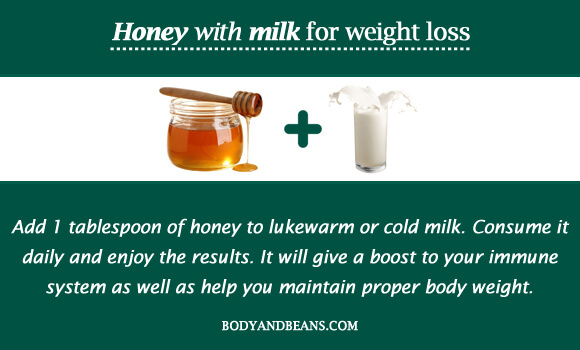 Drinking honey and warm water can seriously help you to lose weight. It is said that honey positively increase the levels of “good” cholesterol in the body, and reduces cardiovascular strain. Thus, you can lead a more active, healthy life, which will promote your weight loss plans, since you will not be worried as much about atherosclerosis, or the risk of heart attacks or strokes when going for a morning run! Therefore in order to stimulate this beneficial process, all you need to do is to drink honey (about one tablespoon daily), with an equal amount of warm water. The honey-warm water mixture will also help wash away the unwanted toxins from your system. Another efficient method to reduce weight is to consume honey along with warm water and lemon juice. This is probably the best way to start your day. Honey contains 22 amino acids and a number of valuable vitamins and minerals, many of which help in proper metabolic functioning. By regulating the function of the metabolism, food is utilized properly, fat is converted into usable energy, and overall health is improved. In addition, the lemon juice in this mixture also is loaded with Vitamin-C (also known as ascorbic acid), which increases liver function and fat metabolism. Furthermore, lemon juice increases the function of glutathione, which is a key antioxidant for detoxification and quick slimming. Thus, this elixir, if drunk once a day, can give you some seriously attractive results. 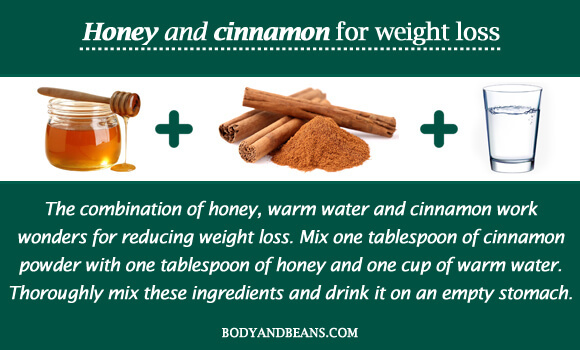 The combination of honey, warm water and cinnamon work wonders for reducing weight loss. Cinnamon is proved to be beneficial in reducing body weight. High blood sugar levels can lead to increased storage of fat in the body but Cinnamon has a regulating effect on blood sugar levels, and the metabolism of glucose. Combined with the metabolism power of honey, this mixture can be a powerful boost to your weight loss efforts. All you need to do is to mix one tablespoon of cinnamon powder with one tablespoon of honey and one cup of warm water. Thoroughly mix these ingredients and drink it on an empty stomach. Instead of commercial health drinks and table sugar, which add to your body weight, you can add 1 tablespoon of honey to lukewarm or cold milk. Consume it daily and enjoy the results. It will give a boost to your immune system as well as help you maintain proper body weight. You can try granola and honey combination as it serves as a healthy breakfast option or evening snack. 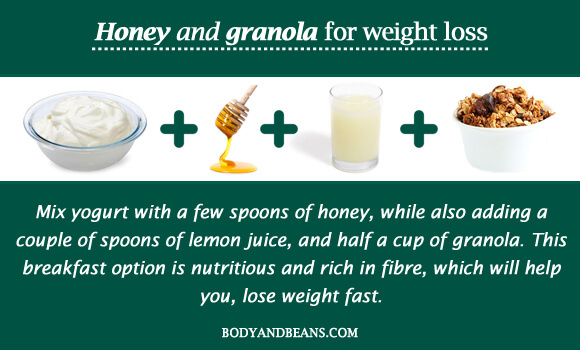 All you need to do is mix yogurt with a few spoons of honey, while also adding a couple of spoons of lemon juice, and half a cup of granola. This breakfast option is nutritious and rich in fibre, which will help you, lose weight fast. Apple Cider Vinegar will reduce food cravings, strengthen immune system and speed up metabolism. 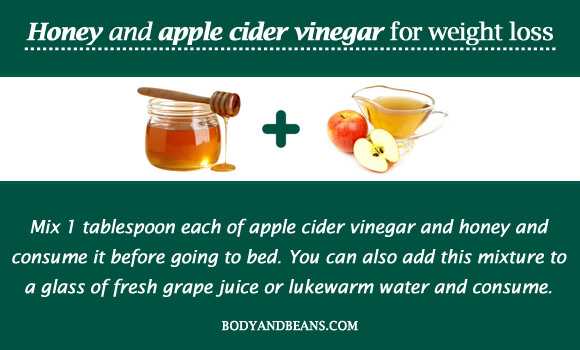 You can mix 1 tablespoon each of apple cider vinegar and honey and consume it before going to bed. You can also add this mixture to a glass of fresh grape juice or lukewarm water and consume. Consuming a spoonful of honey before going to bed is also a good technique to reduce weight. As you sleep, the honey will continue stimulating liver function, keep your metabolism burning fat, and easing the amount of stress hormones that are in your system. This forms a part of the hibernation diet as it helps you hibernate in a healthy and relaxed way. Honey has been identified as the ideal food to stock liver glycogen during sleep. Consuming honey after dinner, especially after having a large meal is also a very good technique of losing weight. Honey improves your digestion, which is beneficial to reduce static weight in your digestive system. I am sure you are wondering how this is possible. 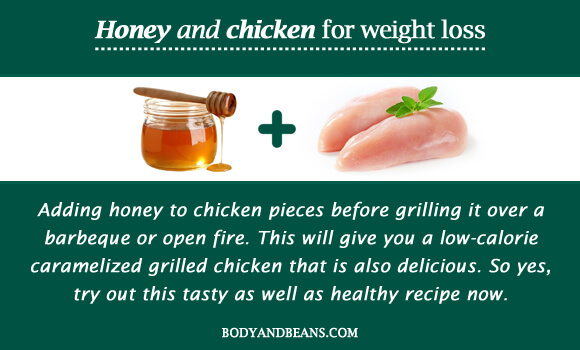 But yes, you can always make things interesting by adding honey to chicken pieces before grilling it over a barbeque or open fire. This will give you a low-calorie caramelized grilled chicken that is also delicious. So yes, try out this tasty as well as healthy recipe now. This is another efficient way of losing weight. Normally, to digest sugar, many essential nutrients like the stored vitamins and minerals get used up. These nutrients are essential to dissolve fats and cholesterol, so ingesting pure sugar is somewhat wasteful. Therefore, when you eat too much sugar, you tend to gain weight not only because of the calories but from the subsequent lack of vitamins and minerals. Honey is a good and healthy substitute for table sugar. You can use it in different beverages such as tea, limejuice. Among other food items, it can be used in desserts, pancakes instead of sugar. One may add honey to oatmeal, peanut butter sandwich for additional nutrients, good taste and a lower risk of weight gain. Ginger tea is a metabolism booster, and when it is combined with honey, it becomes an elixir for digestion and weight loss. Just boil 1 cup of water, add 1 tablespoon of chopped ginger, and simmer for 5 minutes. Remove the strain and let it cool till lukewarm. Then add 1-teaspoon honey and stir well. However, you can consume it with green tea as well. Just add a green tea bag to a cup of hot water. Allow it to steep for 15 minutes. 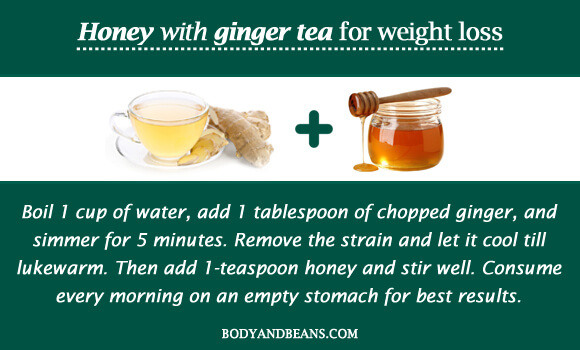 Remove the tea bag, add 1-teaspoon honey and then stir it well. Consume any of the tea every morning on an empty stomach for best results. Fruits are always very important for our well-being. But do you know that adding honey to it can serve as a beneficial snack or dessert. Just add 1 tablespoon of honey to any fruit juice of your choice and consume daily on empty stomach or add 1 teaspoon of honey to a cup of chopped fresh fruits of your choice and consume as a snack or dessert. This mixture is also very effective for weight loss. Take an aloe vera leaf and scoop out gel from it. 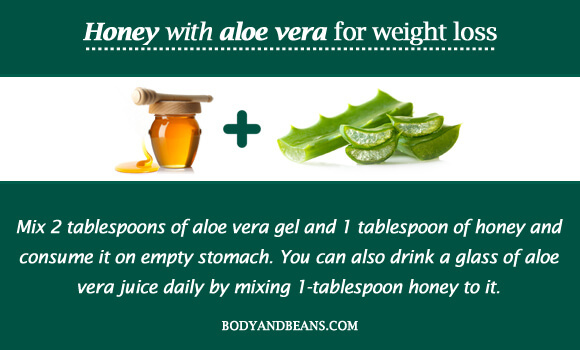 Mix 2 tablespoons of aloe vera gel and 1 tablespoon of honey and consume it on empty stomach. You can also drink a glass of aloe vera juice daily by mixing 1-tablespoon honey to it. Fenugreek will keep your appetite at bay by making you feel satiated. It will decrease the hunger pangs and automatically there will be fewer intakes of calories. But mixing it with honey is even more beneficial. Just roast few fenugreek seeds in a pan. Crush the seeds in to powder using mortar and pestle. 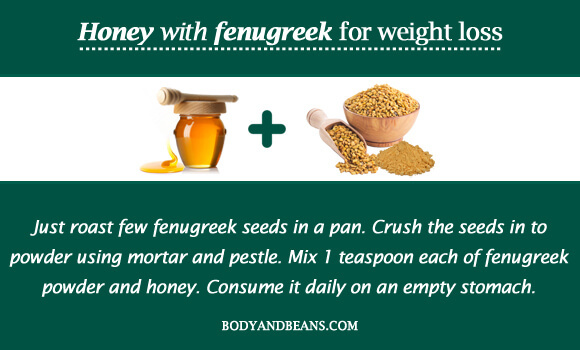 Mix 1 teaspoon each of fenugreek powder and honey. Consume it daily on an empty stomach. Ok so I am sure that you must be surprised to know this but yes there are several massages, which can be done using honey. If you can massage properly on the targeted fat areas, these are indeed beneficial to reduce fat from body. Here are a few of them. Mix 2 teaspoons of honey and drops of lemon essential oil, 2 drops mint oil and 2 drops of lavender essential oil. Massage on clean fatty areas for 15 minutes. Take a normal bath after letting it rest for 30 minutes. Alternately, you can choose any essential oil of your choice. Repeat 3 times a week. Mix 3 teaspoons of honey, few drops each of lemon juice and olive oil. 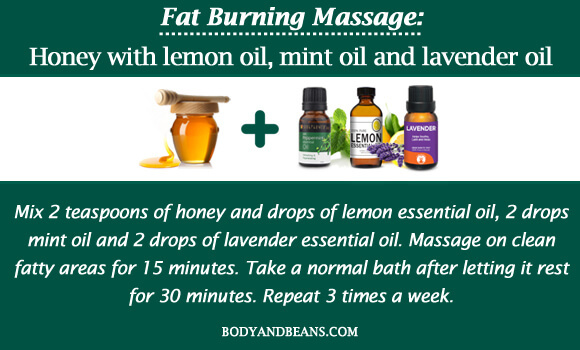 Apply this mixture on fatty areas and massage for 5 minutes. Let it rest for 20 minutes and rinse off with lukewarm water followed by cold water. Repeat 2 times per day for better results. Add 2 teaspoons of coffee granules to 1-tablespoon honey. Massage the mixture on clean fatty areas for 15 minutes. After 20 minutes, go for a bath. Repeat 3 times a week. If you are suffering from belly fat, which is the most common problem in obesity, just go for this massage. Here are the few simple steps. Take an aloe leaf and scoop out the gel from it. Mix 1 tablespoon of aloe vera gel and 1 teaspoon each of mayonnaise and honey. 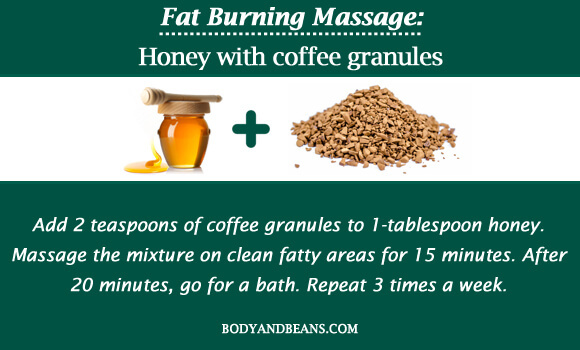 Apply this mixture on fat belly and massage in circular motions for around 10 minutes. Let it rest for 20 minutes. Then rinse off with lukewarm water followed by cold water. Repeat once in a week. You will notice results after few massages. Mix 1/2 teaspoon each of honey, sour cream and turmeric powder. Massage on fatty areas for 10 minutes. Let it rest for 15 minutes and rinse off with lukewarm water followed by cold water. Repeat once in a week. Honey is full of sweet goodness. It can be used as a healthy and delicious sweetener instead of using artificial sugar. It’s loaded with a number of healthy nutrients and it’s magical for weight loss and great for your health and well being. But just a few word of caution before you start using honey for weight loss. If you are suffering from diabetes, you should abstain from consuming honey because it is full of carbohydrates and can increase your blood sugar levels immediately. Limit your consumption of honey to 6 tablespoons a day as too much consumption of honey can also lead to high blood sugar levels, high insulin levels, and other problems. Please do not skip meals and starve, as these will weaken your immune system that is very essential for your well-being. Nevertheless, not to worry as adequate intake of honey together with proper exercise, balanced diet and plenty of water will work heavenly for reducing the body fats. For weight loss, there is however no one particular method that is most effective than others. So try out all innovative methods as per your convenience to find out which one works better for you. Just be dedicated and enjoy the fruitful results. So are you excited? Let me know how much weight you managed to lose after incorporating honey into your diet. I wish to meet your fitter and slimmer version soon.